This past weekend was one of closure for several shows on offer within Toronto’s artistic programme. The Clock, Christian Marclay’s champion effort to evoke the romantic and elusive nature of time as regarded through the cinematic lens, saw its final moments at The Power Plant on the evening of Sunday, November 25. The single channel video and sound work is cleverly comprised of film clips displaying timepieces – analog wristwatches, digital alarm clocks, and the sundials of bygone days—as well as less obvious indicators of time’s passing, such as burning cigarettes and changing clothing. Over the course of Marclay’s 24 hour film loop, these fragments of cinematic history trace every minute, inscribing images on the rote of daily living. When Eastern Standard Time registered midnight last Sunday, the collaged narrative concluded with a coordinated time stamp of 12 AM. Luckily for Canadians, omnipotent art lovers Jay Smith and Laura Rapp facilitated the National Gallery’s purchase of one of six editions of the art work, guaranteeing that it will only be a matter of time before The Clock strikes again. As the days grow shorter, perpetuating the feeling that there is too much to do in too little time, I find myself thinking of a fabled character who is also ruled by the steadily advancing hands of his clock—that frenetic Lewis Carroll creature, the White Rabbit. For anyone who didn’t catch The National Ballet of Canada’s rendition of Alice’s Adventures in Wonderland, which also closed this weekend (in order to usher in the annual torment of Nutcracker Season), the ballet’s second run in the span of 18 months was surprisingly well received. I will admit that at Saturday’s matinee performance, although happily shanghaied by my mother for an afternoon of frippery and high tea, I remained skeptical that I wouldn’t be completely annoyed at the experience. 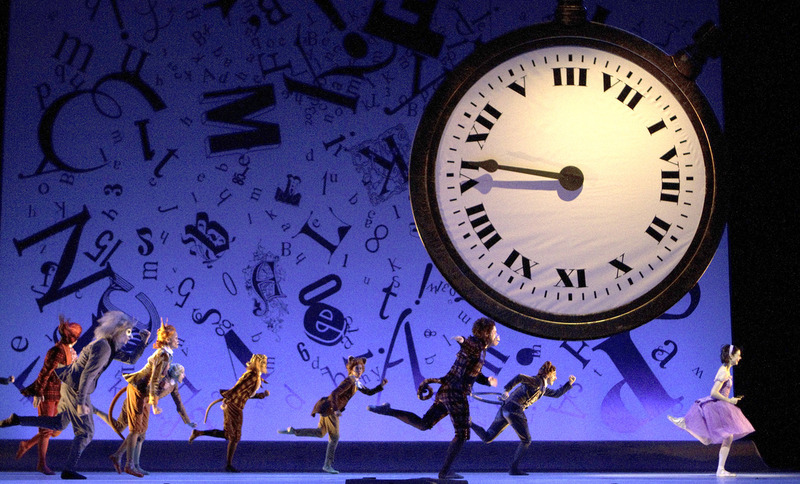 A language-forward piece of prose such as Alice’s Adventures in Wonderland seems an unlikely adaptation for the ballet, given the impossibility of translating the intricacies of wordplay to movement. Where I expected gimmickry, however, I found a unique chance for dancers whose careers are often dictated by the fervent emotion of bodily expression to access choreographic levity. The playful content of Carroll’s whimsical story literally enabled NBOC to take the piss out of balletic norms, both through outrageous prop/set design and hilariously mimed slapstick. With minor alterations, the narrative arc of the story is fairly true to the original: girl is partaking in bucolic activity, girl sees White Rabbit, girl follows White Rabbit down a hole (albeit, this time, said hole is in the middle of a gargantuan bundt cake on the family’s harvest table). Thereafter, bodily enlargements and diminutions due to various consumed goodies occur until Alice once and for all finds herself ensconced in Wonderland. Given that Sonia Rodriguez, who performed the female lead on Saturday afternoon, can’t reasonably manifest a change in size, designer Bob Crowley and lighting designer Natasha Katz imagined an elegant and vibrant solution: changing the scale of the green screen-like projected backdrop such that the spatial illusion becomes convincing. As the optically realistic projection of the doors Alice is too large to surpass expand to take over the entire backdrop, the tiny girl cowers dramatically, completing the trompe l’oeil effect. 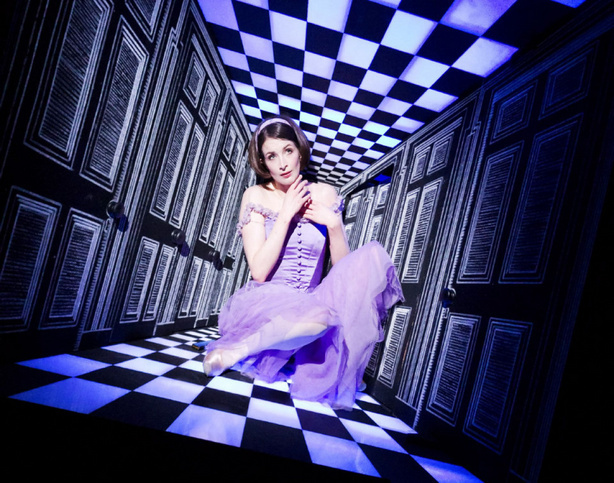 Reminiscent of directorial phenom Robert LePage’s hyper-technological stage craft, these virtuosic interventions are one of the most enjoyable and innovative elements of Alice’s Adventures in Wonderland. At times bisecting the stage medially or placed right at the curtain line, whirlpool-like graphics and moiré patterns give new insight into how we experience the inevitable two-dimensional barrier between our bodies and planar art. 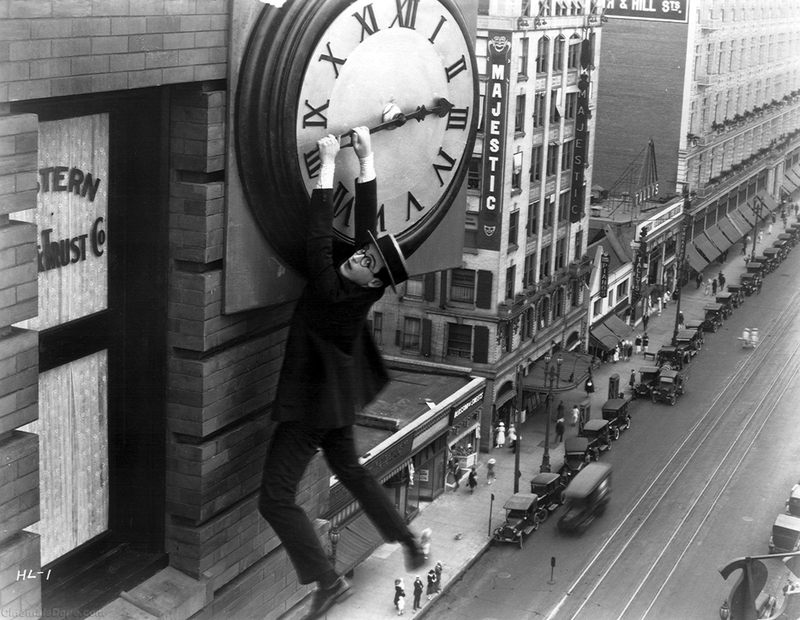 As in each of the film clips comprising The Clock, the partition created by the “silver screen” becomes a window onto the looking-glass realm that confronts its audience. 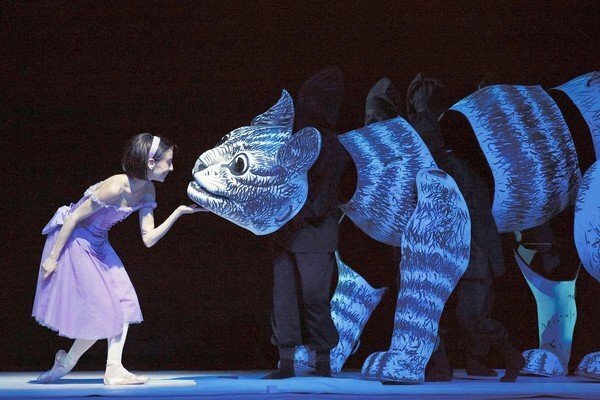 Alice’s Adventures in Wonderland, therefore, is an instance where the theatrical and the cinematic collide among the supple bodies of ballet dancers. Beyond the visual bravura above described, Christopher Wheeldon’s choreographic wit also made its mark. Interludes of Gregory Hines-inflected tap dancing, performed by a flamboyantly clad Mad Hatter, were complimented by the boisterous gestures of a cleaver-wielding Cook, whose grotesque visage and bird’s nest hair would have suited Helena Bonham-Carter in many of the roles she has acted. The Queen of Hearts, perched absurdly on top of her overgrown bustier of a throne, was fittingly played by Greta Hodgkinson, a Prima who obtained her Donna status under the répétiteurship of James Kudelka. Although Karen Kain, who emceed the recent Sobey Art Award Gala at MOCCA, took over as Artistic Director of NBOC in 2005, even a change in leadership wasn’t enough to knock Greta off her out of her ivory tower. More subtle moments peppered the production as well; including a smart parody of The Sleeping Beauty’s famed Rose Adagio in the final act. Wheeldon created a facsimile of the original choreography, in which Aurora’s four suitors each take turns presenting her with a flower. The Queen of Hearts replaces Aurora and each klutzy suitor presents a jam tart in place of a bloom. Despite my enjoyment of the ballet, a disappointing final solo variation by Guillaume Côté had me looking only laterally at the stage in discomfort. As Alice’s love interest and clad in a modern-day outfit of fitted jeans, a t-shirt, and white sneakers, the principle dancer’s melodramatic soliloquy belonged within the confines of Ice Capades. Cote’s outfit had me anticipating a Jerome Robbins-style number with a touch of West Side Story swagger. Instead, his over-emotional élongés were flaccid, leaving me unfulfilled. Both The Clock and Alice’s Adventures in Wonderland expose humankind’s continuous fixation on a certain fact of life: namely the paradox between the truth of being and the false promises of images, space, and the real. Whether entrusting your consciousness to the mesmerizing re-articulation of cinematic history or awakening the dormant but perennial drives of childhood through fairytale, alternate dimensions become pregnable once more through the experience of contemporary works of art. Time and dimensional exploration will most likely continue to fascinate plebs and intelligensia alike until someone manages to orchestrate time travel. Until then, one of art’s accomplishments will be the ultimate relinquishment of control, tumbling backwards down an experiential rabbit hole. This entry was posted in Case Study, The Ministry and tagged alice's adventures in wonderland, christian marclay, Dimensions, Four Seasons Centre, Guillaume Cote, Helena Bonham Carter, Jay Smith, Laura Rapp, lewis carroll, National Ballet of Canada, National Gallery, Rachel Anne Farquharson, Sonia Rodriguez, Space, The Clock, the power plant, Time by Rachel Anne Farquharson. Bookmark the permalink.